What is a 'Swap' and how to make a swap? When you delete a social media profile that you may no longer need to replace it with another. That means, if you delete a brand that has, let’s say, 4 social media profiles. 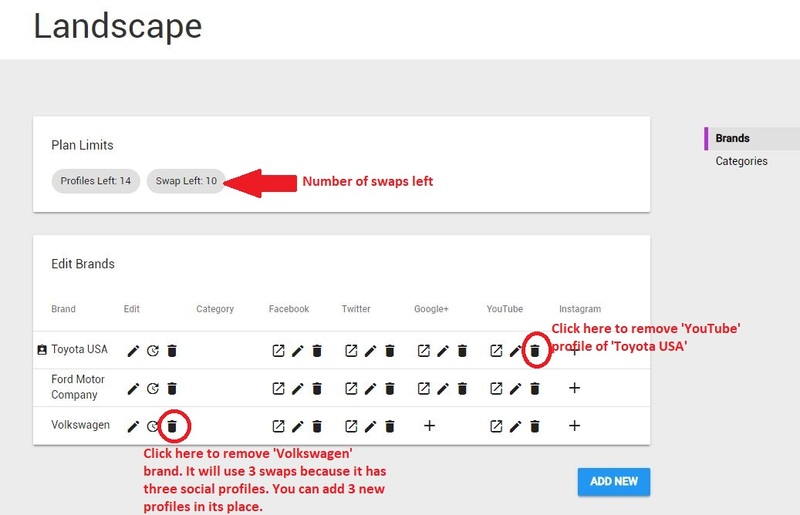 It means you have used four swaps because you can now add 4 new social media profiles in its place. You can check the number of ‘Swaps’ left in the ‘Landscape’ section. Note: You cannot ‘Delete’ a brand if you have only two brands added. You need at least three to do so. However, you can delete a social media profile if you have two brands with at least two social media profiles. Go in the ‘Landscape’ section and click the ‘Delete’ icon adjacent to a brand to delete it. Or the ‘Delete’ icon adjacent to a profile to delete it.